BlackRock Call for Entries for 2016 is Open! Submit Your Proposal! The BlackRock Call for Entries for 2016 Gallery Exhibition Proposals is now open! We encourage artists, curators, and coordinators for artist groups, art collectives and arts organizations — who live in Washington, DC, Maryland or Virginia — to apply. 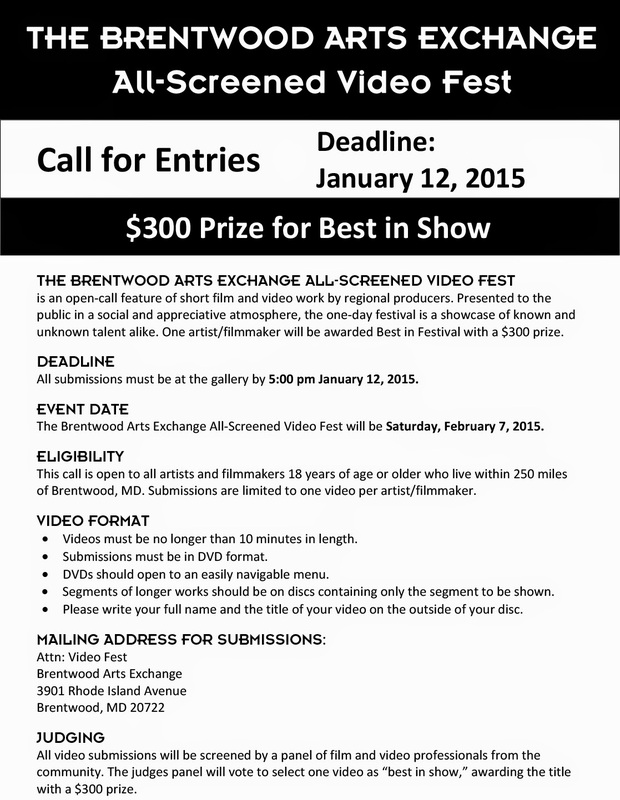 The deadline is December 19, 2014. 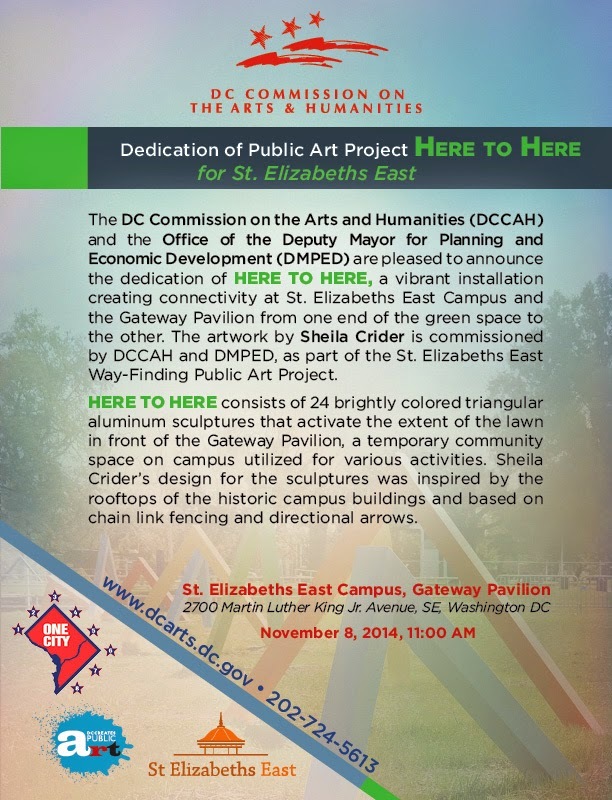 The DC Commission on the Arts and Humanities (DCCAH) and the Office of the Deputy Mayor for Planning and Economic Development (DMPED) are pleased to announce the dedication of Here to Here, a vibrant installation creating connectivity at St. Elizabeths East Campus and the Gateway Pavilion from one end of the green space to the other. The artwork by Sheila Crider is commissioned by DCCAH and DMPED, as part of the St. Elizabeths East Way-Finding Public Art Project. Here to Here consists of 24 brightly colored triangular aluminum sculptures that activate the extent of the lawn in front of the Gateway Pavilion, a temporary community space on campus utilized for various activities. 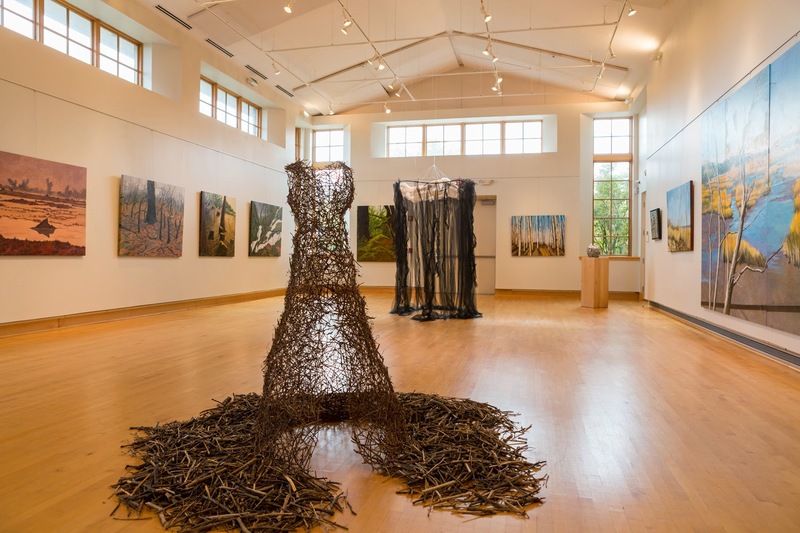 Sheila Crider's design for the sculptures was inspired by the rooftops of the historic campus buildings and based on chain link fencing and directional arrows. I have just learned that The Gazette newspapers intend to terminate Dr. Claudia Rousseau's visual arts review column this coming Friday (Nov. 7). This is part of an apparent planned decimation of arts coverage in general by the Gazette newspapers (owned by the Washington Post). I suggest that you contact Will Franklin at wfranklin@gazette.net and send him an email on the subject. Lenny is correct! We, the arts community, cannot stand around and meekly allow this to happen. For those of you who care about the arts coverage, it's time for action in the form of phone calls, emails or letters to voice your concerns. We need a lot of your voices heard! Take action! Contact Will Franklin at wfranklin@gazette.net and send him an email on the subject. Here's a copy of the email that I sent to Mr. Franklin tonight. I am disappointed to hear that The Gazette intends to eliminate the arts review column by Dr. Claudia Rousseau. The coverage of the visual arts is a critical part of news media. I am a reader of the Gazette because of Dr. Rousseau's columns on the visual arts. Without the cultural component of visual arts in The Gazette, you do a disservice to your community of readers. I ask that you reinstate Dr. Rousseau's column and commit to the cultural literacy of our community. Even with economic pressure, there are ways that The Gazette can bring fresh visual arts news to its readers via its online format. The community needs more arts coverage, not less. I reiterate to reinstate Claudia Rousseau's visual arts column. These are the times that a newspaper like yours can be a leader in presenting creative thought and ideas. 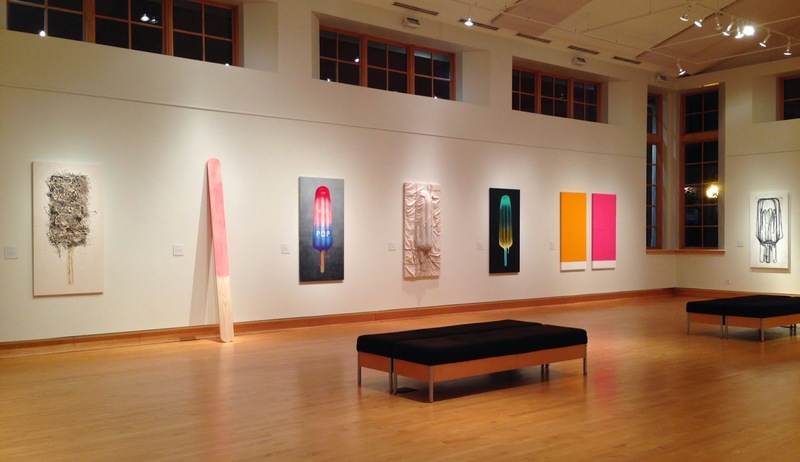 Claudia Rousseau's column adds insight and critical thought to the region's art scene. With an established reputation as an art critic, Ms. Rousseau has brought her vast knowledge of the visual arts to your readership for the past 11 years. I firmly ask that you address The Gazette's commitment to the visual arts and to be a contributor to your readership by fulfilling your mission to deliver high quality news.